Every day at Krannert Center, artists of every genre from across the campus and around the world come together to create. It happens in classrooms, shops, rehearsal halls, and of course, on our magnificent stages. 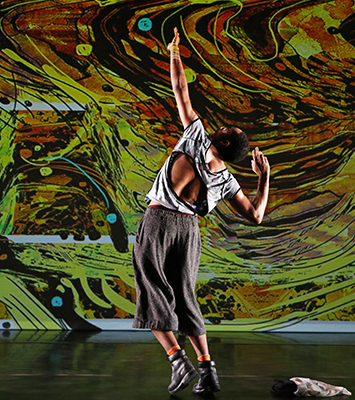 On November 15, 2018, Cynthia Oliver, Dance at Illinois professor and associate vice chancellor for Research for the Humanities, Arts, and Related Fields at the University of Illinois, moved and inspired Krannert Center audiences as she and her award-winning COCo Dance Theatre presented her newest work Virago-Man Dem. This powerful, evening-length piece was accompanied by masterclasses and other engagement work and offered new perspectives on Caribbean and African-American masculinities and identities. As part of the Center’s Marquee Visiting Professional Artist Series, this was also a unique opportunity to celebrate Oliver’s incredible artistic collaborators, including the University of Illinois-affiliated Jason Finkelman, John Jennings, Stacey Robinson, and John Boesche. And with an audience composed of more than 50 percent students, Krannert Center’s commitment to affordable student prices was especially important to keeping this perspective-changing work accessible for all. Want to make sure that every generation has the ability to experience life-affirming art and public engagement events? Join the Krannert Center 50th-Anniversary Access for All Challenge today. During this two-season initiative, every dollar given will be matched by generous sponsors. Any gift, small or large, makes an impact in supporting the Krannert Center Youth Series, engagement programs such as Dance for People with Parkinson’s, and other free and low-cost events such as family concerts, Krannert Uncorked, and the Opening Night Party. Individuals, organizations, and businesses can lend their support now at KrannertCenter.com/Give. Thank you! Gifts to this special matching challenge do not qualify for membership benefits. For information on these benefits or to help sponsor the matching portion of the challenge, please contact development [at] krannertcenter.illinois.edu (subject: Access%20for%20All) or 217.333.6700.